That is a game changer - fantastic! Thanks Andy. Awesome find! Thanks for posting. On the HTML side, I simply added a 'button' to a list that called the downloadToExcel() function. Amazing Andy! Thanks for sharing!! Hey Andy! I tried this trick out, and it works on Chrome/Mozilla. Any way to get it and download on Safari?? Sorry, I am a Mac user. Hi Andy! This is awesome - I've been looking for a way to make a "user friendly" export while still hiding the source view. One question though - it doesn't look like any filters the user applies are automatically passed. Do you know how I can set filters dynamically on an image url? Or am I better off using the URL action in the dashboard using a sheet that has the image? Thanks in advance! Did you find a way to pass user applied selections dynamically to the link? IE there was possible to filter on states, and the user selected Califorina, then the export should contain only information from California. Sigmund, I have not looked into this case explicitly, but you should be able to add the filters to the URL. Hey Andy, similar to Sigmund, I wanted to add dynamic filtering to the export. In other words, I have multiple users accessing the dashboard, and some want to filter based on their respective location, group, etc... It wouldn't be efficent to imbed the filters into the url for several hundred people as they will have multiple possibilities. Is it possible to pass quick filter selections into the URL so that the export shows the fitered options? I don't see any reason why this wouldn't work, but I haven't tested it either. Look at Tableau's documentation for how to pass options to the URL and see if it works. Has anyone tried to do this yet? I am looking to see how to export from the server the filtered information by the user!! Excel format is not supported, but that shouldn't be a hurdle. The cvs will open in Excel. This is great. However is the columns are not coming out in the order that I had hoped. Is there a way of enforcing the order that the columns are output? I do not know what happens under the covers when you export. How are they coming out for you? Alphabetical? Order seems a little arbitrary. Hi - I am having the same issue. Any advice? rename those with the order number as prefix, e.g. 1_col, 2_col, etc. This would preserve the order. Of course it is not the best practice, but should solve the ordering problem. I hope Tableau comes with the solution of customizing the export feature. Did you ever get a work around for this? I looked at Chris' post below but that didn't work. Dropping the hash tag did not enable the current view to be generated. Seems like only the original published view is generating. Has anyone been able to export "filtered" CSV data by this method? (That is the CSV export dataset reflects changes the user has made to the hidden view via actions and quickfilters.) Try as I might, I cannot. I am using Tableau Server. If you pass the filters into the URL, then that would get you what you're looking for. I need this. Quite badly. Jumping right into it I ran into the same problem as Shawn - the #n was interfering. Drop the #n from the UR, append ".csv" and everything's peachy. Now if I can only figure out how to get the crosstab downloaded through a similar route - I'm running into numeric precision problems and would like to see if a sideways approach would work. Thanks for the clarifications and feedback Chris!! Not exactly this post's topic, but related: when copying or exporting a crosstab Tableau always honors the view-specific number formatting. According to Tableau this is by design - and thanks to them for responding right away to my asking about this. I understand the "by design" position, and in this case, like many others e.g. copying/pasting data from HTML tables, the only real response is: "well, the design is not good and a redesign is called for". If nothing else copying and exporting data and crosstabs should be symmetrical in how the the data is rendered at the destination. Chris, Perhaps I am missing something but dropping the hash tag no affect. Only the original published view is being generated. Do you guys know if there is a URL to get the Crosstab csv? Not that I'm aware of. However, you could design the worksheet you want to export to look the way you want it to export and that should work I believe. Great stuff! Are there any known ways to select which worksheet would be exported? Ie: for cases where each sheet on a dashboard has different data fields, this might not suffice for an end user. This does not seem to export the results of applying quick filters. How do you add quick filters to URL dynamically? My reports have a date filter on dashboard, so user can select a data range for the data. When i export the dashboard using .csv extension it does not reflect the date selection. How do i add this dynamic filter to the export url? Ravindra, if you have a range date filter, you could create a calculated field that captures the min date and another that captures the max date, and then pass those fields in the URL. I am also facing the same issue, In my dashboard I have two date parameters like " From Date" and "To Date" and also few filters are there. How to pass these parameters and filters to that URL . Could please provide the Syntax for that . I have gone through that Knowledge base article, I have doubt in that in this URL "Market=west" is mentioned ,Instead of giving the direct value over there, can we pass the values dynamically. why because , in my requirement I have so many records is there, I can't pass the one by one manually right. If we choose the filter the data should change dynamically. please suggest this. In Case if i need to set the 50 values over there how to do this dynamically, I Can't write the all values over there right., Please suggest this. As far as I'm aware, you don't have any control over the order of the columns on export. But hey, at least you know how to export it now. thanks for this interesting post - but am I right that this method don't export the “true crosstab” format that you build up in you AExport worksheet? 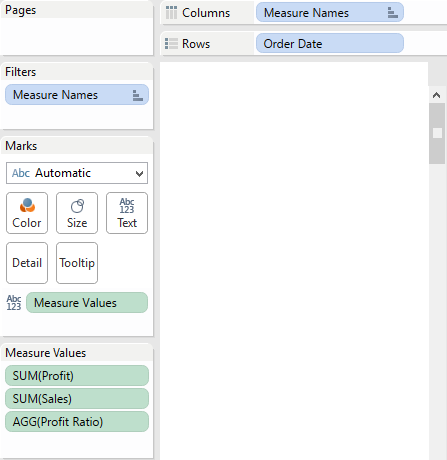 Because there you have measures as columns - the export will end up as "raw data" format where all measures end up in one column (good for being further used in excel pivot but bad for senior management ;-)). This is probably the same issue as with exporting a csv while using tabcmd (for example see http://community.tableausoftware.com/ideas/1987). Do you now any way to get the same view as in the underlying sheet? Roberto, the CSV can easily be imported into Excel and formatted nicely, but you are correct in that Tableau doesn't export it exactly as you design it. The CSV export via this method will give you the same result as the tabcmd option. There's currently no way to get the same view as the underlying sheet that I know of. So it's back to the Bat Cave Batman. The ONLY way to get what we want is to have the user click the standard Export - CrossTab built into Tableau server. Opening the workbook will not work since it assumes you are starting a brand new session and so only your default (published) filters and params are available. Using any kind of URL will only work if you have single params to pick from (or max/min dates to pass). Since this only covers a small number of use cases, we must get the user to click an embedded worksheet on a dashboard and then use the Tableau standard export. In my case we were trying to do this with a 300,000 row download. So the last thing we want is to tax the vizSQL engine with rendering all that data. I think this approach may provide adequate speed although it is sinfully ugly. 1. Create a worksheet with the data you want on Details. Nothing on rows or columns. 2. Ensure filters are global or applied to this worksheet from your "driver" worksheet. 3. Choose Mark Type "Shape" and select one you like - I chose a circle. 4. Make the Shape bigger and squish the screen down to show just a few. 5. Put an instruction Title on such as: "To Export Details, Click on the circle below and then click on Export (icon above) and choose Crosstab". 6. Go to your dashboard and drag the worksheet on whereever you want. 7. Publish and test. The user will have to click in the circle to "Highlight" it and then do the export. For more fun: Since you are embedding a live worksheet on your dashboard it will take extra time to process. Get around this by adding a Boolean filter that the user can checkmark with a title such as "Fetch Details for export". The circle will disappear when this is false and reappear when it is true. Oh my gosh - it almost looks like workflow. Except it's ugly! Thanks for the detailed suggestion Damian! I followed all the steps indicated, I was able to download the csv file, but I am facing a weird issue. My csv download works correctly if the data to be downloaded has approx 900 records, if it's more than that, all I get is a blank csv file. Has anyone else faced this, or knows any workaround. I've never seen that issue before. I always gets all of the data. We can export any sheet into CSV file format. http://localhost/views/ followed by Workbook name, dashboard name & Worksheet name. I would think this trick will work if you included data from a blended table into the table that's being exported. I say that because Tableau is simply exporting that table. That being said, I haven't tried it. I didn't see any additonal comments on how to re-order the columns so they are not alphabetical. Is there a way to do this? Thanks! I have not seen a way to order the column output. Ops23, the Excel icon is just that, an icon. Add an image object to the dashboard, choose an Excel icon, then add a hyperlink. Hi Andy, thanks for the great tip! Just a quick question about the URL, which I have to add to the image object. I am working with a workbook on my desktop and, in such case, what kind of URL should I add to the image object? The point of this post is to make the CSV accessible on Server. For a local file, typically the format file://host/path will work. Hi Andy. How would one reference a particular dashboard/worksheet using the file format? I'm also working with local (packaged) workbooks. For example, I've tried "file://host/path/[workbook name.twbx] | [dashboard name]" with no results. Daniel, the export functionality does not allow you to choose a specific sheet. As I outlined, it uses the first worksheet in a dashboard alphabetically. An option might be to publish the additional sheet, but hide the tab and then call that tab. Thank you for good stuff and knowledge shared. Can you please explain to me how to run CSV export on a local file. I think my url format to local file is bad. I did the same thing as Daniel and I am getting nothing. Hence, what exactly do I need to do in order to make it work? This is a nice tip, Andy. Thanks! I, too, am having some issues downloading the user-filtered output. When I upload my visualization to our Tableau server, the only csv file that downloads only shows the output from the last filters I applied prior to uploading to the server, regardless what changes I make to filter values when using the server version of the visualization. I understand I can reference quick filters in the URL, but only with static, pre-entered values (e.g. Region=Central). I need the filter values to behave dynamically in response to use input in my server version of the visualization. Is this possible? Someone mentioned that they would like to see one row for an order date followed by columns of Sales, Profit, Profit Ratio. Easy to do, just change the AExport worksheet to have the these as 'blue pills' - that is, make each of the measures discrete and place each on the Row shelf. The new sheet should have all as blue pills - Order Date, Sum(Sales), Sum(Profit), Agg(Profit Ratio). Brad, I was hopeful that this was the solution but no luck. Using Andy's method Tableau is performing a Data export vs a Crosstab export. This is frustrating for 2 reasons. Although manually it is pretty fast using Andy's method, clicking the icon to generate, takes over 30 seconds. Yikes! Additionally, even though the export as Data method does look pretty, I tell my users that the output format is more Pivot Table friendly. That seems to make them happy'ish. I am doing everything exactly the way it showed here. I can download a file when I click on image. But the file is blank. What am I doing wrong here. This is frustrating. im having the same trouble, any one knows why? After a little testing it appears that the order you drag the worksheets into the dashbord matters. When I dragged "AData" in before "Sales" it exported properly. When I dragged "Sales" in first, "AData" didn't export properly. I am using dual axis in my sheet. When I try to export the data in .csv format, It gives me underlying data. Is there anyway to export the data on the sheet in csv format. This is a great tip! Is it possible to do with Tableau Packaged Workbooks accessed through Tableau Reader? 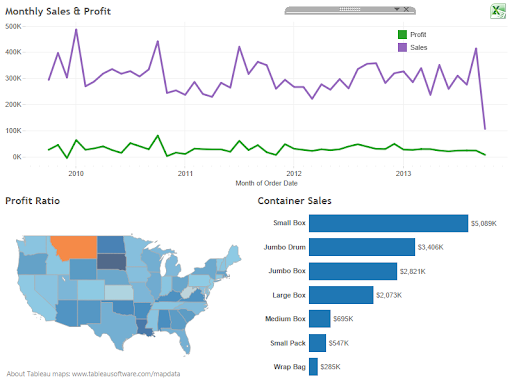 If you have Tableau Reader then you can simply export the data. It'd be great to have this functionality of clicking an icon to export a csv from a Tableau Packaged Workbook as well. This is a much more intuitive interface for users. Do you know if it is possible? Thanks for the article! Tried this on an on-premise Tableau Server configuration, after clicking icon/url I get a 406 Not Acceptable error in IE, and Chrome and Firefox don't present any errors, but also do not open the file (nothing happens). Should this work? Any ideas? Found the problem (this may be specific to SQL Server data sources). If any of the data sources are set to live vs. extract, then the 406 occurs. Once I changed all my data sources to Extract, then the .csv trick worked. Hi Amyjolo, I tried by passing parameter by end of the URl, But I am not able to get filtered data. Could you please suggest me. how to resolve this. This is great, except that it is for exporting only 1 sheet. I have a dashboard with 3 sheets, and i want to have filters applied to all of them - and then be able to export - all of them. This doesn't seem possible using this method, due to the fact that only one of them can be made first in alphabetical order. In your workbook, you can set the filter to apply to all sheets using the same datasource. Then in your hidden data sheet (which is the one exporting) just build it to include all the data you need. I did this, as i have 3 charts, but just built my hidden sheet to show the data i wanted. My issue is exporting once a user has set the filters. I haven't experienced any problem with Server 9.2 using this method. I am correct in stating the worksheet detail Aexport with white font still needs to be published for this to work? It wont get a URL without publishing, correct? Correct, otherwise it'll export the next sheet alphabetically. Ok, thank you. Only concern is the worksheet is visible within the project on the server (creates some clutter). Wish could easily copy and paste from a view in Tableau--especially useful when using Tableau detail for a work list or queue to fix information in source systems, etc. Still a slick trick and perfect timing for a project I'm working on. Much Appreciated! Any help what url to insert when working with local copy? I have a tableau version below 8.2, so I cannot publish it publicly. How can I open the report in the browser? What's the url? I am trying to automate the download process in a script. I am not able to do it even though I pass the auth token in the header. Works if I login to the tableau from the browser. Any idea about what other headers need to be passed for making a REST call to download the views? Sorry, I haven't used the REST API, so I'm not sure. I'd consult the help documentation. For some reason it's not working for me either. Followed the same examples as you did and created a sheet called "AExport" as well (added it to the dashboard, etc...) but as soon as I use a ".csv" extension in the hyperlink, it gives me an error of "Problem trying to load hyperlink." But if I leave the dashboard with the ".twbx" extension or file location, the hyperlink works for the folder location or opens up another dashboard just fine. Having trouble with the ".csv". Thoughts? I'm currently using Tableau Desktop 9.0. Does the version matter? Unless somethings changed that I'm not aware of, it should work on Public. Public is merely Server after all. Am I missing something then? Like I said, I can get it to download when I am signed in to Tableau Public, but if I am signed out it just tries to get me to sign in to download it. Notice that it's public.tableau.com not public.tableausoftware.com. I have a quick query on csv data export from tableau using URL. I have used this to extract the csv data export and I was able to create that successfully. As a next step, I have published the workbook on server and changes the filters to export the csv for a different set of filters but unfortunately no filters are working on the csv sheet I am exporting after changing filters. For e.g. If I published the workbook with Region filter as “North America” and on server if I change the filter to “South Asia” and export the csv file I still gets the csv export for Region “North America”. Please note: I have applied the filters to all the worksheets, so ideally if user changes any filter it should be applied to the sheet I am calling in URL but it looks like the csv file retains the filter applied while publishing the workbook. Is there a way to apply the filters to the csv export? Hi, I'm trying to export a csv from the worksheet that dynamically adjusts based on the filters and parameters a user has selected. I'm able to dynamically pass the filter and parameter values to the url - however, when nothing is being filtered for, I get a blank worksheet. Has anyone experienced this problem/know a potential workaround. Thanks, this works. But I want to ask- if I have 3 charts on my dashboard and I want to download a separate csv for each graph, how can that be achieved? Not sure if this would be of any help, but apparently all "new" format files ending in X (.twbx, .docx, .xlsx etc.) are compressed XML archives, which carry their own data within. In a situation where I could see that the data source was a .CSV file, I simply right-clicked on the .twbx file, unzipped it in its own subfolder (I had 7-zip installed which adds the right-click context menu) and, within that unzipped folder, you will find a Data subfolder. My .CSV file was there in all its unadulterated glory. I haven't tested for other types of embedded data sources, would be curious to hear if anyone else has come up with some more solutions. Have you had any success getting this to work with stories? It looks like the URL doesn't change from point to point within a story. TIA! Laura, story points don't have individual URLs like dashboards or worksheets, so you can't export them individually with this method. I did the same way but whenever i click the excel button its routing to the dashboard not downloading the .csv. Can you help me here? Brilliant tip. thanks Andy. If there are 2 charts in the dashboard, which one does it pick to export? Whichever one you specify. Read through the post again and you'll see. I've tried but have had two major issues: 1) I get duplicate entries in the resulting CSV equal to the number of entries I've included in the export sheet; and 2) The CSV extract includes all measures and their values in two columns - one with an identifier and another with the value. What I need is a single copy of each entry and for each measure to be separated into a unique column for easy of viewing. Such a neat tip, Andy - thank you! Also, you can use X/Y positioning under the layout options to place the AExport sheet entirely off the canvas -> no need to format and trying to hide the sheet on the dashboard. I can't thank you enough for this tip! I've been having an issue over revealing some of the dataset to users, but not everything ... this works beautifully. Thank you! Is anyone else having troubles getting this to work since the most recent update to Tableau? Whenever we try to use it now it keeps giving errors that there is nothing there. It will not work for me either. I'm using Tableau Server. The link to CSV - http://public.tableau.com/profile/andy.kriebel#!/vizhome/ExporttoCSV/Dashboard.csv does not seem to be working now. I thought I could implement your solution to my question posted on tableau community at https://community.tableau.com/thread/228829. Appreciate your help! I contacted Tableau about why it was no longer working and they said they have implemented a new URL structure for accessing views with Tableau Public. That means adding the .csv to our URL's will no longer work to download summary data. They did mention that it still works for Tableau Server and Tableau Online, but for us who use Tableau Public it appears we are out of luck for the time being. Thanks for the update! Glad it still work on Server. Enjoyed reading through this blog concerning converting a viz to csv file (over three years of comments!!) A number of comments noted they wanted the csv to be dynamically filtered on the dashboard – manually completed adding the suffix: ?&dim1=wantedvalue at the end of the URL. 1. When publishing the dashboard also publish the wanted viz/csv separately from the dashboard. a. Copy the html path of the viz from the share menu listing the web path on the tableau web page. 2. 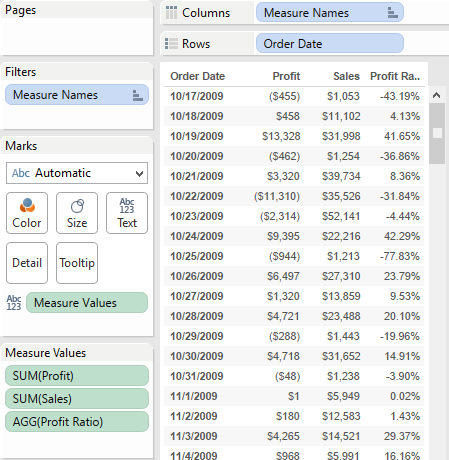 At the Tableau Desktop create a view with wanted dimension(s) – creates distinct list of values. c. Move the calculated dimension to Tooltips mark. 5. Publish the dashboard and view. 7. Hopefully the excel sheet will appear. Note: spoke with the Tableau Help Desk trying to make the action a click rather than the menu clikc but no solution? I'm trying to download the sample workbook and it is no longer available? It's fixed. Apparently Dropbox changed some things. In this approach global filters are not applicable to the export file. Is there a way we can make global filters applicable? Can we pass quick filter to this URL and download the filtered data using .csv added to the URL? Example if i select state FL and City Orlando, when user click the excel image set with this URL, they should able to download only FL and Orlando filtered data .. the filter in the URL should change dynamically and download the data? I have 3 workbooks in a dashboard and could export only 1 out of 3, any suggestions? You'd have to run 3 exports. Here's a blog post with updated URLs for TWBX, PDF, PNG and CSV that can be used on Tableau Public. This should solve some of the issues raised in the comments. I love this idea and it works, but the data export formats the data very strangely when you have multiple measure values. Is there anyway to do the same kind of functionality, but similar to the download crosstab function in Tableau server? Still works on server 10.1.1! Thank you! This is great! Hi. Did you tried by passing dynamic filter/parameter to export to csv file?? Anyone have any luck with using the URL with a query param? Which link are you clicking on? I checked the dropbox link at the end of the post and that works fine. 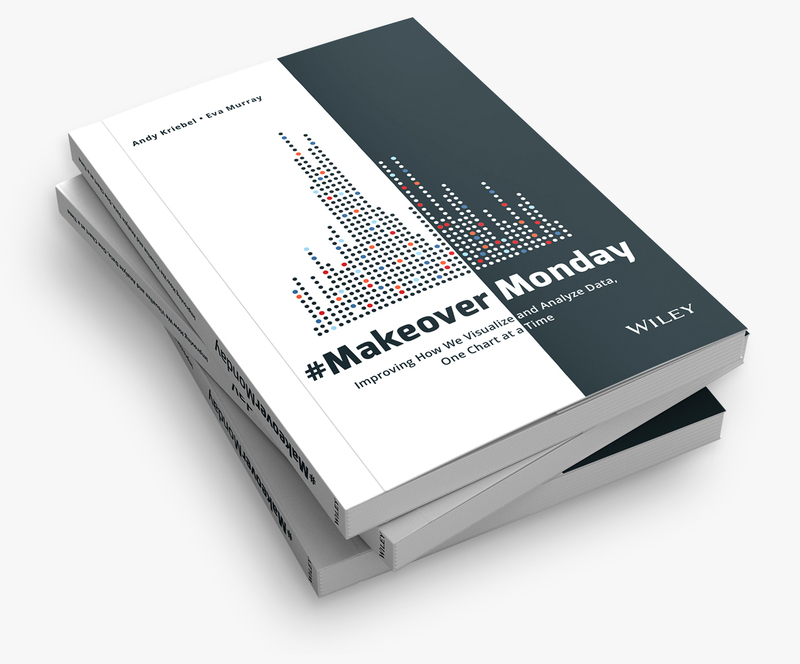 You can also download the workbook from the interactive viz in the post. This will work if i don't hide the AExport sheet(10.5), but wont work if i hide the sheet..does any one come across this issue? Vasu, I suspect you’re not doing something right. You should definitely be able to hide the sheet. But can it be done at Server End and by the users who do not have desktop version? As long as they have access to the Server, yes it will work. I can't get this to work - it keeps pulling the worksheet that is 2nd alphabetically. I'm using Tableau Desktop 10.4.2 and deploying to a Server 10.4 version. I have a worksheet titled aExport added as a floating object with "Fit->Entire View". I tried hiding, unhiding, shrinking to 1 pixel and also making it large. Same result every time. Any ideas? I can't get this to work either. 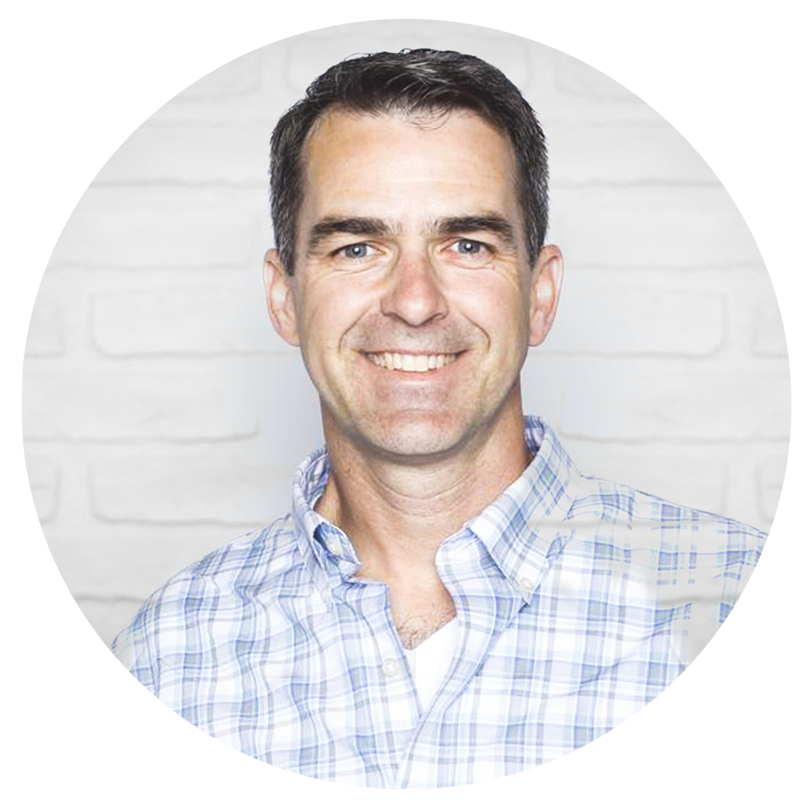 When I click on your excel icon above, I get https://public.tableau.com/profile/andy.kriebel#!/resource-404. I followed your instruction, named my sheet AExport, linked the image using this URL https://public.tableau.com/views/SCLS-Turnover/TurnoverDashboard.csv but get a similar error message https://public.tableau.com/profile/scls#!/resource-404. Could the move from http: to https: be causing issues? Is there another way to do this? This doesn't work on Tableau Public Jody. It's designed for Tableau Server. Order of the column changes when i download the csv file.How do we fix it?